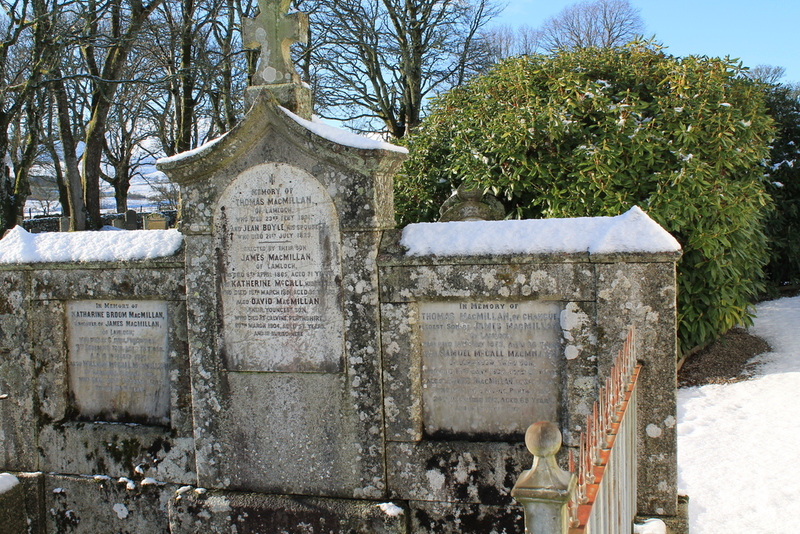 (3 Plaques within railed plot) (PLAQUE NEAREST CHURCH) In memory of James MACMILLAN of Changue, eldest son of James MACMILLAN of Lamloch, who died 15th Feb, 1873 aged 36 years. Also Samuel MCCOLL MACMILLAN, of Corriedow, third son, who died 12th Jan. 1902 aged 61 years. Also James MACMILLAN, fourth son, who died at Calvine, Perthshire 24th December 1913, aged 69 years, and is interred here. MIDDLE PLAQUE: In memory of Thomas MACMILLAN of Lamloch who died 23rd Feb. 1831 and Jean BOYLE, his spouse who died 21st July 1829. Erected by their son James MACMILLAN of Lamloch who died 8th April 1865, aged 71 years. And Katherine MCCALL his spouse who died 18th March 1851, aged 35 years. Also David MACMILLAN their youngest son who died at Calvine, Perthshire, 26th March 1904, aged 57 years, and is buried here. (PLAQUE FURTHEST FROM CHURCH) In Memory of Katherine Broom MACMILLAN daughter of James MacMillan of Lamloch, who dies at Calvine, Perthshire 3rd December 1919 age 76 years and is interred here. Also William McCall MACMILLAN of Lamloch, second son, who died 26th October 1923 in his 86th year. GC, “Kirkyard gravestone 182,” Carsphairn Archive, accessed April 20, 2019, http://carsphairn.org/CarsphairnArchive/items/show/224.